On 6 December 1917, Chikuhei Nakajima founded one of the first aircraft manufacturing companies in Japan. Originally known as the Japanese Aeroplane Research Institute (Nihon Hikoki Kenkyūsho), the company went through a few name changes and was reorganized as the Nakajima Aircraft Company, Ltd (Nakajima Hikōki KK) in December 1931, with Chikuhei Nakajima as its chairman. At the onset of World War II, Nakajima felt that the United States had vast industrial resources and that the attack on Pearl Harbor would have dire consequences for Japan. Nakajima believed that the only way to ensure a Japanese victory was for Japan to have a reliable method to consistently attack the US mainland. Such attacks would require the US military to divert offensive forces to defend and protect the US. The 36-cylinder, 5,000 hp (3,728 kW) Nakajima [Ha-54] was an ambitious engine program. The engine was needed long before it would be ready. The project was cancelled to reallocate resources to more urgent needs. In 1942, Nakajima made his thoughts known to the Imperial Japanese Army (IJA) and Imperial Japanese Navy (IJN), but neither service gave Nakajima much consideration or any support. Frustrated, Nakajima used his company’s own resources to design a large bomber capable of striking the US mainland from Japan. Nakajima designated his bomber design Project Z (or Z Airplane). After months of research, Nakajima again approached the IJA and IJN in April 1943 with his Project Z proposals. The IJA and IJN were more receptive, but there was no consensus between the services on the aircraft’s design, specifications, or mission. The IJA and IJN submitted an updated proposal to Nakajima in June 1943, and through the remainder of 1943, Nakajima worked to solidify the Project Z aircraft design. In August 1943, Nakajima distributed his thesis, “Strategy for Ultimate Victory,” to IJA and IJN officials and to prominent politicians. The thesis outlined strategic use of Project Z bombers to attack industrial targets in the US. The bombers could fly from Japan to Germany and strike targets in the western US as well as industrial areas in the mid-western states. Once in Germany, the bombers would be rearmed and refueled to make the return trip to Japan, again striking the US. The attacks, combined with their effect on production, was predicted to halt the US advance against Japan and aid in the defense of Germany. Sectional drawing of what is believed to be the final configuration of the [Ha-54] engine. A single-rotation propeller is depicted. Note the cooling fan at the front of the engine, the annular intake manifold at the middle of the engine, and the supercharger impeller at the rear of the engine. Induction manifolds are shown at the top of the drawing, and exhaust manifolds are at the bottom. 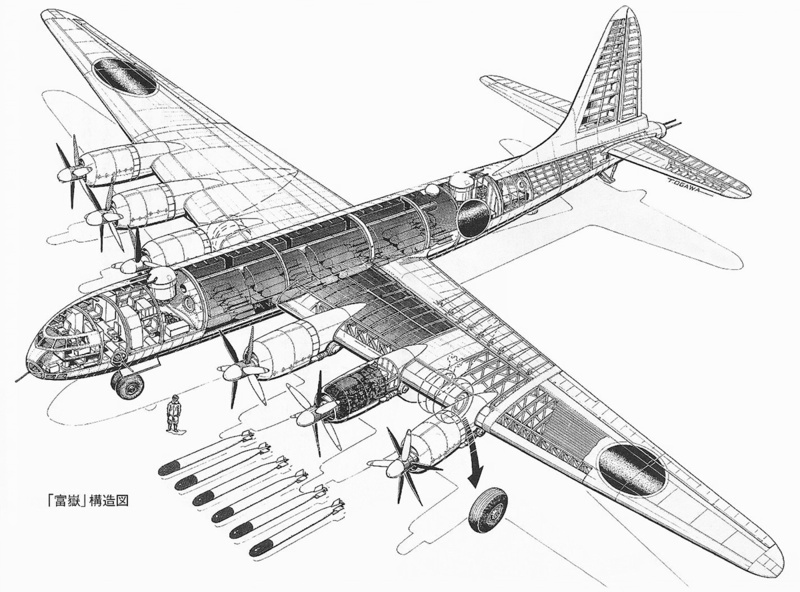 Although several different designs and configurations were investigated, the Project Z aircraft that entered development was a six-engine, long-range bomber of all metal construction. The proposed aircraft had a wingspan of 213.2 ft (64.98 m), a length of 147.6 ft (44.98 m), and a height of 28.8 ft (8.77 m). Project Z had an empty weight of 143,300 lb (65,000 kg) and a maximum weight of 352,739 lb (160,000 kg). The bomber’s top speed was 422 mph (679 km/h) at 32,808 ft (10,000 m). Project Z had a maximum range of 11,185 miles (18,000 km) and a ceiling of 49,213 ft (15,000 m). Such a massive aircraft required very powerful engines; however, no engine in Japan had the power that Project Z required. To solve this issue, Nakajima decided to make a power plant that could support Project Z by coupling together two existing [Ha-44] engines. The [Ha-44] was the most powerful engine that Nakajima was developing, and the new combined engine for Project Z was designated [Ha-54]. The heritage of Nakajima’s radial engines lies in licenses the company acquired to produce the Bristol Jupiter, Pratt & Whitney R-1340 Wasp, Wright R-1820 Cyclone, and Gnome-Rhône 14M. Nakajima obtained the Jupiter license in 1925, the Wasp license in 1929, the Cyclone license in 1933, and the 14M license in 1937. While Jupiter engines were produced, the Wasp and Cyclone licenses were obtained to gain knowledge, and Nakajima did not produce those engines. Many Nakajima radial engines used a 146 mm bore, which directly corresponded to the Jupiter’s 5.75 in bore, and several Nakajima personnel spent a few months in the US being instructed by Wright as part of the license agreement. The general construction of Nakajima radials resembled a combination of Bristol, Pratt & Whitney, and Wright engines, and Nakajima engineers consistently incorporated their own thoughts and ideas into their engines. This model of the [Ha-54] illustrates the significant structure proposed to mount the engine. Such a mounting system would make engine maintenance very difficult, with the entire engine needing to be pulled to change a cylinder on the rear engine section. Note the exhaust collector ring and its outlet, which would lead to a turbosupercharger. When Nakajima started to develop their own engines in the late 1920s, their designation system consisted of their name and the engine type followed by the engine model letter. As an example, the designation “NAL” represented Nakajima Air-cooled L model. When Nakajima started to develop a new class of high-power engines in the early 1940s, the focus was on air-cooled engines. Subsequently, the letter “N” and the engine type were dropped from the engine designation system. A new letter was used to designate the next generation of engines, followed by the engine model letter. As an example, the designation “BH” stood for B generation H model. Japanese companies, the IJA, and the IJN all had their own designations for engines. To eliminate confusion (or perhaps add more), a joint designation system was introduced in May 1943. Nakajima [Ha-44] was the joint designation for the engine that would be the basis for Project Z’s engines. The [Ha-44] carried the Nakajima designation BH, the IJA designation Ha-219, and the IJN designation NK11. 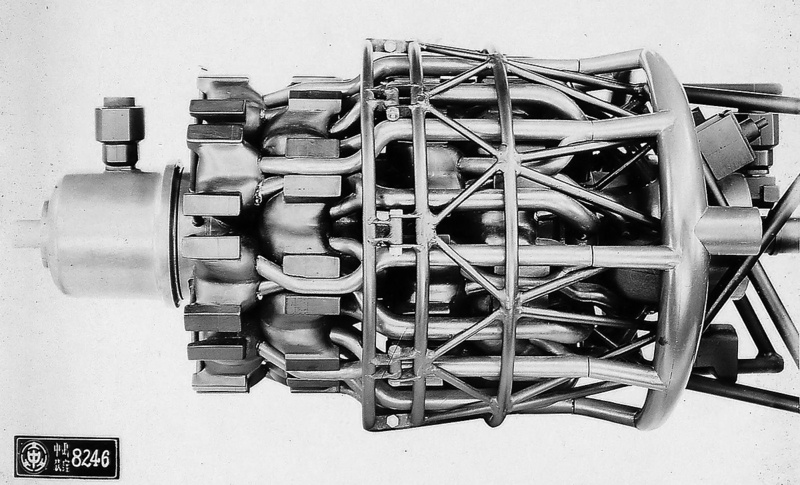 The [Ha-44] was an experimental, 2,942 cu in (48.2 L), 18-cylinder, air-cooled, radial engine. Development of the [Ha-44] began around 1941, and the engine was based on the 14-cylinder Nakajima [Ha-34] (Nakajima NAL, IJA Ha-41/Ha-109, and IJN NK5). By mid-1943, the [Ha-44] was producing 2,400 hp (1,790 kW) at 2,700 rpm. Two [Ha-44] power sections would be connected to make up the [Ha-54] engine. This drawing depicts the cooling air flow of the [Ha-54] engine. This was the proposed configuration, but sufficient cooling for the rear cylinders was never achieved. Note the cooling fan at the front of the engine and the intake manifold ring at the center of the engine. The [Ha-54] engine carried the Nakajima designation D-BH, for Double-BH. It was also designated Nakajima Ha-505 by the IJA but had no known IJN designation. Developed under chief designer Kiyoshi Tanaka, the engine was a 36-cylinder, air-cooled radial with two-stage supercharging. The [Ha-54] was comprised of two [Ha-44] engine sections bolted together via an intermediate section. 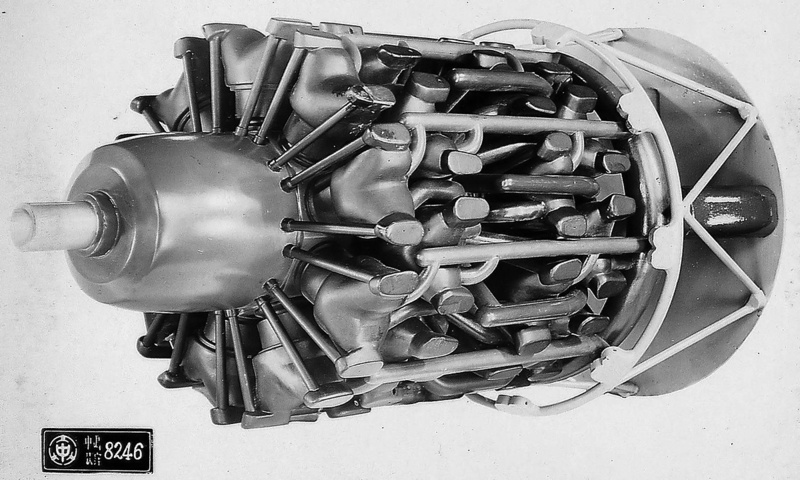 The two engine sections formed a single four-row radial engine with nine-cylinders in each row. The crankshafts of the two engine sections were directly joined, and neither engine section could operate without the other. 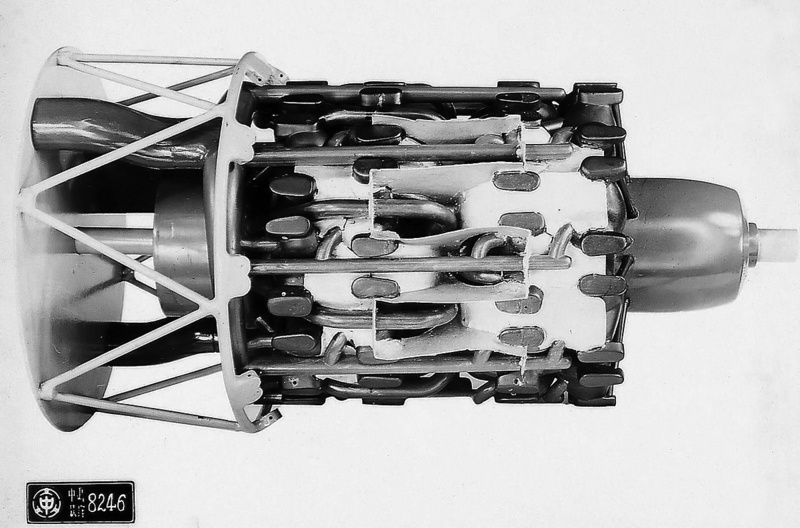 The [Ha-54] used cylinders constructed of an aluminum head that was screwed onto a steel barrel. Each cylinder had two valves that were actuated by pushrods driven by cam rings. Exhaust gases flowed into a collector ring positioned behind the engine. Two ducts led from the collector ring, with each duct delivering the exhaust to a turbosupercharger located farther aft in the engine nacelle. The pressurized air from the turbosupercharger was fed through an intercooler and into a three-speed, mechanically-driven supercharger at the rear of the engine. The supercharger’s impeller was 19.69 in (500 mm) in diameter, and it was driven at 1.00, 4.77, or 5.88 times crankshaft speed. The fully-charged air from the supercharger was directed to an annular manifold at the center of the engine. Induction air for the front and rear engine sections was distributed from this central manifold. Because of this configuration, cylinders on the front engine section had rear-facing intake and exhaust ports, while the cylinders on the rear engine section had front facing intake ports and rear facing exhaust ports. Other methods to distribute air into the cylinders were investigated, including the use of two supercharger impellers at the rear of the engine, with each impeller dedicated to one engine section. In addition, some versions of the engine did not employ a turbosupercharger. Nakajima tests indicated that cooling the [Ha-54] engine would be difficult. This model shows one of the final cooling configurations and matches the above drawing. Air flowed through the cylinders of the front engine section and exited at the center of the engine. Air that flowed over the front cylinders was directed down to flow through the cylinders of the rear engine section. Some sources state a low pressure fuel injection system was planned for the [Ha-54] engine. Other Nakajima engines injected the fuel directly before the impeller at 14 psi (.97 bar). However, a different fuel injection point may have been selected to avoid the constant presence of a volatile air/fuel mixture in the annular induction ring at the center of the engine. Anti-detonation injection was also available for takeoff or emergency power. Cooling the huge engine posed a serious issue, and much research was devoted to finding an adequate solution. Investigations were conducted to employ fan-assisted, forced-air cooling with an engine-driven fan positioned at either the front or rear of the engine. Another plan involved ram-air cooling for the front engine section and reverse cooling for the rear engine section. In this configuration, baffling separated the air flow from the front and rear engine sections. Air to cool the rear engine section was brought in via the wing’s leading edge, made a 180-degree turn, flowed through the cylinders of the rear engine section, and exited cowl flaps positioned at the middle of the engine. A fully-cowled model of the [Ha-54] with ram-air (no fan) cooling for the front engine section and reverse cooling for the rear engine section. Note how the cooling air for both engine sections exited the cowl flaps at the center of the nacelle. Also, the engine depicted did not use a turbosupercharger and had nine exhaust stacks protruding from the cowling. The final cooling configuration involved an engine-driven fan at the front of the cowling. Air was ducted through the cooling fins of the front engine section’s cylinders. The air then exited cowl flaps at the center of the engine cowling. Separately, air was ducted over the cylinders of the front engine section and through the cooling fins of the rear engine section’s cylinders. This air then exited via cowl flaps at the rear of the engine cowling. At the front of the [Ha-54] engine, the crankshaft drove a propeller gear reduction and the cooling fan. The planetary gear reduction turned the propeller at .414 times crankshaft speed. 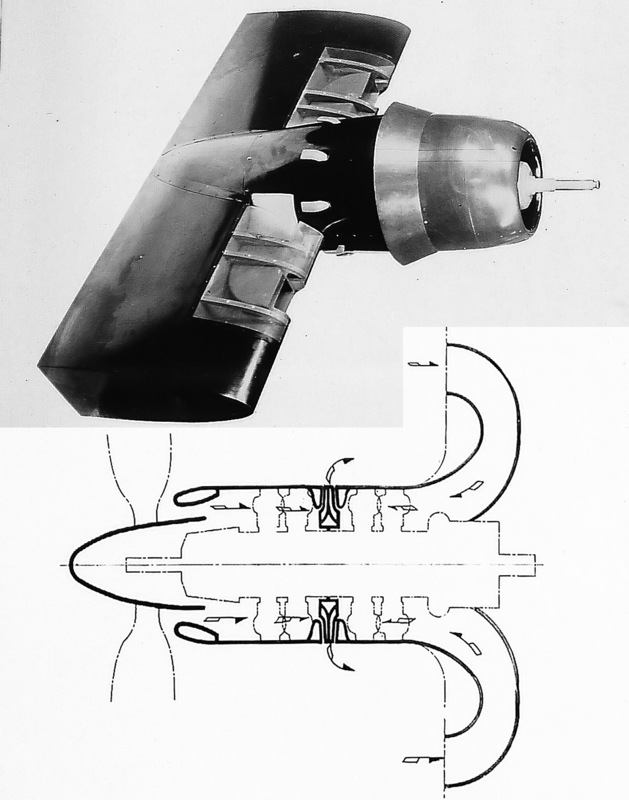 Both single-rotation and contra-rotating propellers were considered, with the final decision in favor of six-blade (or possibly eight-blade) contra-rotating propellers that had a diameter of 14.8 ft (4.5 m). The [Ha-54] engine would be supported by a series of mounting rings that connected to the engine at its center and rear. The Nakajima [Ha-54] had a 5.75 in bore (146 mm) and a 6.30 in (160 mm) stroke. The 36-cylinder engine had a 7.5 to 1 compression ratio and a total displacement of 5,885 cu in (96.4 L). The [Ha-54] had a maximum output of 5,000 hp (3,728 kW) at 2,800 rpm with 11.6 psi (.80 bar) of boost for takeoff and 4,600 hp (3,430 kW) at 2,800 rpm with 7.73 psi (.53 bar) of boost at 29,528 ft (9,000 m). The engine had a diameter of 61 in (1.55 m) and was 141 in (3.58 m) long. The [Ha-54] weighed approximately 5,400 lb (2,450 kg). This drawing of the [Ha-54] shows some of the engine mount positions. Note that there are two supercharger impellers depicted. In this version of the engine, each impeller provided induction air to one engine section. The question of cooling the [Ha-54] was never entirely resolved, and development of the engine was forecasted to take too long. By January 1944, work on the [Ha-54] had stopped, and it is unlikely that a complete engine was ever built. With the the cancellation of the 5,000 hp (3,728 kW) [Ha-54], a scaled-down version of the Project Z aircraft was designed and powered by [Ha-44] engines, which had been developed to 2,500 hp (1,864 kW). The new aircraft, designated Nakajima G10N Fugaku (Mount Fiji) was slightly smaller but still possessed the same, six-engine configuration as Project Z. By the summer of 1944, all of Japan’s resources were needed to protect the homeland, and the prospect of a long-range bomber attacking the US mainland was out of reach. The G10N Fugaku was cancelled, and all work stopped on its engines. After World War II, the Nakajima Aircraft Company became the Fuji Industrial Company, Ltd. (Fuji Sangyo KK). In July 1953, the company merged with four others to form Fuji Heavy Industries, Ltd. (Fuji Jūkōgyō Kabushiki-gaisha). Fuji Heavy Industries manufactured Subaru automobiles and supplied equipment for the aerospace and transportation industries. In April 2017, Fuji Heavy Industries was renamed the Subaru Corporation. The final version of the original Nakajima Project Z bomber with its six [Na-54] engines. Development of the [Na-54] was forecasted to take too long, so [Na-44] engines were substituted, and the aircraft was scaled-down as the Nakajima G10N Fugaku. As Japan’s prospects for an offensive victory faded, the project was cancelled, and resources were reallocated to defense. This entry was posted in Aircraft Engines, World War II on 20 March 2018 by William Pearce.